The Danish conductor and organist Steen Lindholm is well known on the international choir stage. He has conducted at big festivals like Europa Cantat, Nordklang, America Fest and Hong Kong Children's Choir Festival, been engaged f.i. as guest conductor of Groot Omroepkoor (The Netherland Radiochoir) for many years, The Hungarian Radiochoir, Mitteldeutscher Rundfunkchor (Leipzig) The National Youthchoir of Westfalen and the Austrian ORF Chor. 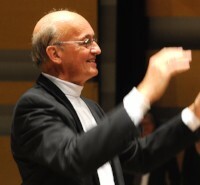 Steen Lindholm has held Master Classes and seminars for choir conductors many places in the world, f.i. USA, Canada, South Korea, China and Argentina - plus all Scandinavian countries including Iceland and the Faroe Islands and Greenland. In his native country, Steen Lindholm was conductor of The Danish Radio Chamberchoir during the season 1982-83 and chief of The Royal Opera Chorus 1985-1990. Since 1971 he is the artistic leader of Copenhagen Concert Choir, and 1992-2006 Chief Conductor of The Danish Boys Choir. Steen Lindholm is an experienced jury member / jury president at international choir competitions in USA, Latin America, Asia and Europe including Scandinavia. He has also been jury member at all issues of World Choir Games / Choir Olympics until now. Steen Lindholm has been rewarded with the prize of the Copenhagen Music Critics and the Order of the Icelandic Falcon.